In today’s market, it’s hard to make sense of what’s what. Deals have grown incestuous for the first time, with outfits like GV investing alongside Uber last week — just months after its parent company, Alphabet, was at Uber’s throat. A $10 million-plus round of seed funding is no longer a joke. Venture firms continue to raise record-breaking amounts of money, despite what feels like creeping uncertainty about how much longer this go-go market can continue. Unsurprisingly, there’s been some talk lately about deal flow and the possibility that some of the most well-regarded early-stage investors in the industry have quietly applied the brakes. Yet new analysis out of Wing, the 7.5-year-old, Silicon Valley venture firm co-founded by veteran VCs Peter Wagner and Gaurav Garg, draws a conclusion that might surprise nervous industry watchers. 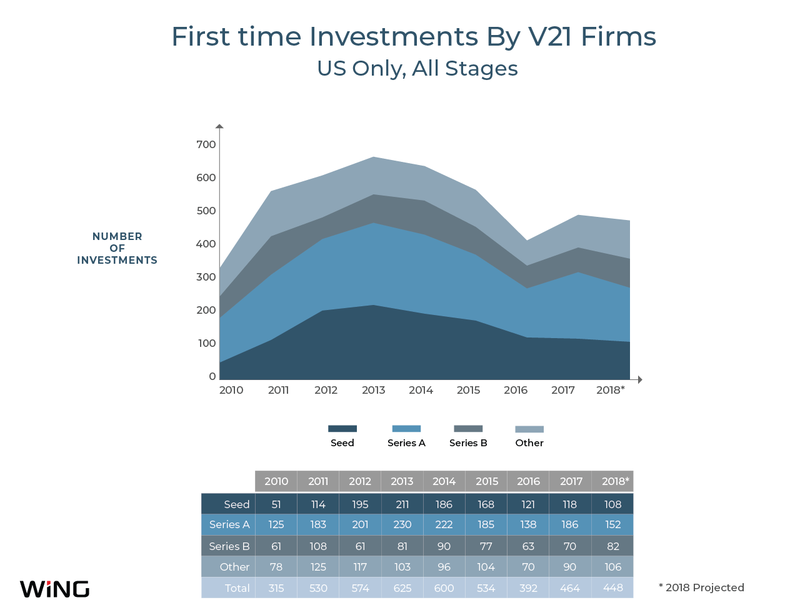 After tracking the investment activity of what Wing considers to be the 21 leading venture firms, it discovered that a pullback already happened . . . in 2016. In fact, Wagner, who oversaw the analysis, tells us there’s been so sign of a slowdown since then. We caught up with Wagner last week to learn more about Wing’s findings — and what might be causing some confusion in the industry right now. TC: First, why do this kind of study right now? PW: There’s been a lot of analysts and reporters and LPs and VCs asking us about our investment pace lately, and I think it owes to talk of Benchmark and Union Square Ventures slowing down, so we thought we’d look at some parameters and see what’s going on. TC: Why not just refer to industry-wide statistics? It seems like there are plenty of these. PW: They’re kind of swamped with the data of less discriminating investors, though. You really want to focus on the signal, which is why we track what the 21 leading venture firms are doing. And in that analysis, we found no signs of a slowdown. We found instead that there was a peak of activity in 2013 and 2014, a pullback in 2016, and an uptick since. We cut it different ways, too. We removed international deals in China and India, because they have their own rhythm and can get frothy. 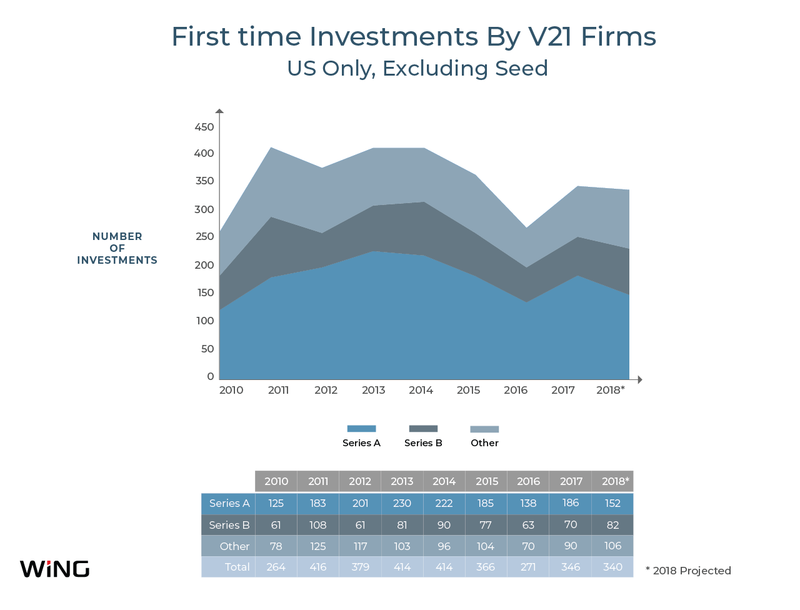 We removed seed deals, given there’s been some major schizophrenia among venture firms that waded into seed deals, then pulled out. Even still, 2017 saw an increase in deals over 2016, which was the lowest year in terms of deal activity since 2010. TC: These were first-time investments? PW: Yes, and the reason is that follow-on rounds are dictated more by the operational needs of companies. Some could be running out of cash, for example, so it’s non-discretionary. If you want to look at sentiment, you have to look at first-time investments in isolation. TC: Do you have 2018 data? PW: We have partial data, of course, and we’ve annualized it to “predict” that 2018 numbers will be close to 2017. That is, if you buy the idea of projecting out, which I don’t really. Also, because you’re looking at a smaller batch of numbers, you’re on thin ice statistically. But for now, at least, we’re seeing a level of activity that was higher than 2016. TC: You can see why things might be ticking along now: the tech IPO market, SoftBank’s massive Vision Fund, big tech companies getting bigger, which keeps the wheels turning. What happened in 2016? Uncertainly about the U.S. presidential election? Bill Gurley’s warnings that a reckoning was coming? PW: I really don’t know that it was down so much versus that prior years were up. It was a more a reversion to the mean. The 2016 number still represents a pretty decent and sustainable pace for this industry. TC: Based on your findings, would you guess a downturn is closer than further away? It seems inevitable, but I’ve thought this for the last three years. PW: It’s a known unknown. We know there will be a change, but we don’t know when or how deep it will be. TC: Could things have possibly changed, given that everything is impacted by tech, that software is, in fact, eating the world? That’s obviously the bull case. PW: It’s pretty darn mainstream, whether via digital transformation or just the massive disruption of massive industries buy digitally native competitors. I don’t know, is the answer. But it’s true. Tech isn’t a sideshow anymore.